The Toronto Maple Leafs continue to trade their present for a better shot at the future. Toronto sent 28-year-old Shawn Matthias to Colorado on Sunday afternoon for a 2016 fourth-round pick and prospect Colin Smith. The Toronto Maple Leafs continue to trade their present for a better shot at the future. 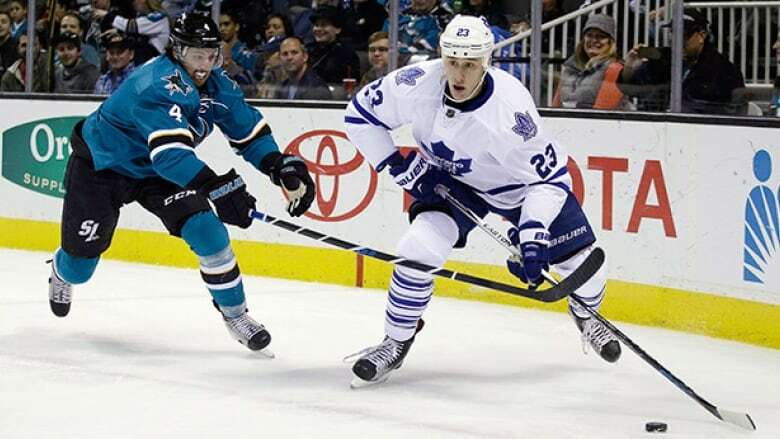 Toronto sent 28-year-old forward Shawn Matthias to the Colorado Avalanche on Sunday afternoon for a 2016 fourth-round pick and prospect Colin Smith. As has been their strategy, the Leafs keep piling up assets for the future, acquiring picks and prospects at the expense of the present. The club, which sits last in the NHL's overall standings with 50 points, now has 12 picks for the upcoming draft in Buffalo, N.Y. after picking nine players last June in Florida. "There's no question, I think, the scouting staff always gets excited with the more picks they have," Leafs general manager Lou Lamoriello said in a conference call following the trade. "Nine [picks] is high, but to have 11 or 12 [picks] is quite a bit." The thought process behind the acquisition of so many selections is simple. The Leafs want to give Mark Hunter, the team's director of player personnel, and his scouting staff as many cracks at the draft process as possible. More picks mean more potential in the organization for the future. Toronto started purging its roster for the long-term a year ago, sending out veterans like Cody Franson, Mike Santorelli, Phil Kessel, Daniel Winnik, and Dion Phaneuf, among others, for some combination of picks, prospects and cap space. That process is sure to continue ahead of the Feb. 29 trade deadline with a number of expiring contracts — P.A. Parenteau, Michael Grabner, and Roman Polak among them —presenting value to potential playoff teams. The Leafs signed a slew of veterans to short-term deals last summer with the implicit hope of swapping them for future assets at the deadline. Matthias, who scored his sixth goal on the season in an overtime loss to Philadelphia on Saturday, was among that group. "You look at it as to what is best for your team, what's best for today, what's best for tomorrow," Lamoriello said. "This gives us an opportunity to stay along the plan that has been put in place, that we've consistently stuck with and continue to do so." For the 2016 draft the Leafs now hold: two first-round picks (one becomes a second if the Penguins fail to make the playoffs), one second-round pick, two third-round picks, two fourth-round picks, two fifth-round picks, two sixth-round picks and one in the seventh. Smith, 22, has 13 goals and 21 assists in 54 games playing forward with the AHL's San Antonio Rampage this season. He will join the Toronto Marlies, currently the top team in the AHL.